I finally admitted a small truth to myself the other day. I’m going through a stage of quiet raw honesty. I think it was kickstarted through various elements and chores for the wedding but it also comes from trying to bring myself into an operating GTD‘er. In GTD, you first need to sit down and figure out what you really want or need, what the outcomes of that look like and then design steps of actions to get yourself there. And I think a lot my often wandering around in a muddle is because I am not clear and honest about what outcomes I want. But also…this process involves being honest about what and who I like and don’t like. Seems like an odd thing to say. Don’t we all know what we like and don’t like? Turns out that I don’t. I think it comes from being a people pleaser and not wanting to rock the boat. It’s just easier to think you like someone or something than to cause trouble by being the dissenter. And the less I quash the “I don’t like …” feeling, the less quietly it whispers. I’m hearing it louder and louder everyday and am quite surprised by what I am discovering. On the flipside, I’ve discovered I like a bunch of things I thought I didn’t … so that’s cool too. This is a charm quilt I started a couple of years ago. It’s meant to be a sampler of all the fabrics that I come past and a bit of a memory quilt to keep a sample of some of my really faovourite pieces (so that I can go ahead and use them in something rather than collect them for the sake of just liking them). 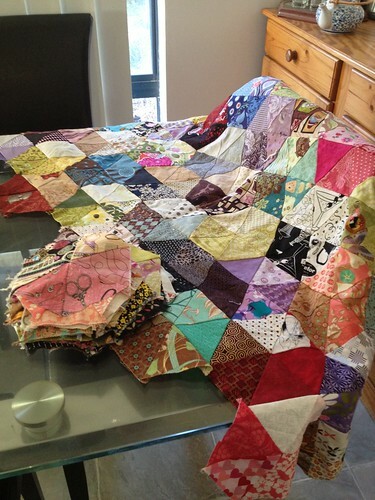 It was based on this gorgeous quilt I slept under when I stayed with Tansy for Christmas/NY 09. Hers has this lovely depth and movement to it in the way she has pieced dark, light and medium colours. I wanted mine to not be an exact copy of hers so I played with it a bit. And I got this. But this project has been stalled for over a year. As part of GTD, I am looking at my project inventory and deciding on the next action to progress each project forward. Or trying to figure out why the progress is stalled – what is the desired outcome, what action is next, what barrier needs to be removed to be able to do the next action etc. And looking at this project, I realised. I hate it. I really don’t like the way it is progressing and there is no enjoyment in working on it. And further, I realised that finishing it won’t help cause then I’ll just not like the finished quilt. There’s really nothing for it but to admit that the next action is to completely unpick the whole thing and start again. I think I know what I did wrong – I tried to keep sets of fabrics together when really, it should have been much more random. And that feels so much better to admit.